I am starting to post my fall decor this week. First of all, let me tell you that I live in a small town of about 6,400 and possibly up to 9,000 or 10,000 with small surrounding towns. I must travel at least 100 miles to shop somewhere other than Kmart, Ben Franklin Crafts, and consignment shops for home decor and craft supplies. That's why I am resourceful! 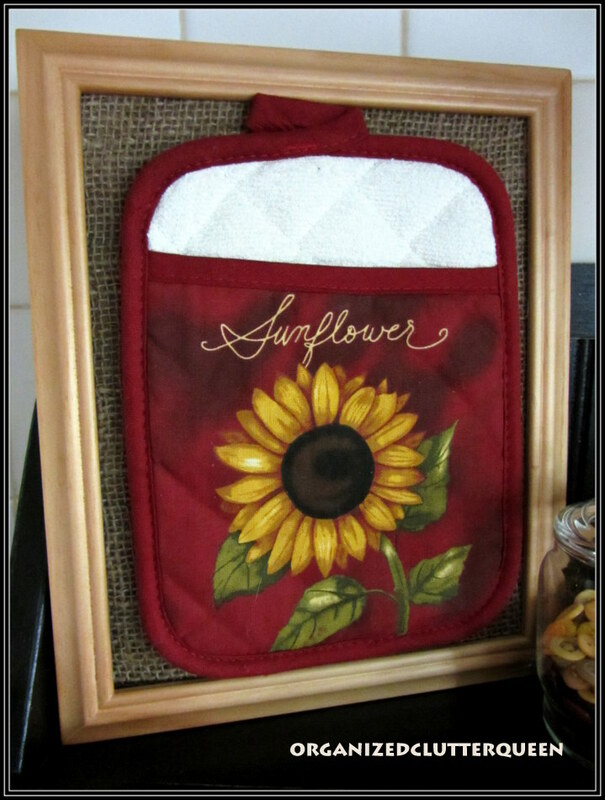 Yes, I framed a Kmart sunflower potholder in an 8 x 10 Kmart light wood frame today! I forgot to take a before pic, but I found one just like it on Ebay. 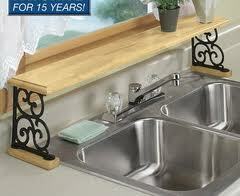 This is the old over sink Martha Stewart Kmart wood shelf and before vignette. 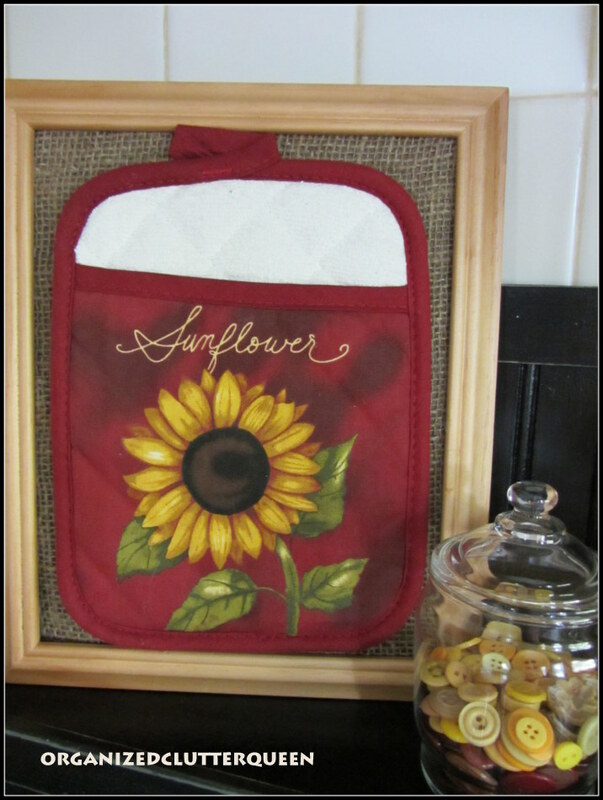 I used a potholder/oven mitt with a sunflower from Kmart for $3.99, and an 8 x 10 frame for $3.99 from Kmart in a light wood frame to match my kitchen cabinets. I cut a piece of burlap to fit the frame and pushed it in the frame with no glass. Then I used double stick carpet tape to adhere the potholder to the framed burlap. I painted the shelf with Rustoleum black chalkboard paint, distressed it lightly and then covered it with Lundmark paste wax. 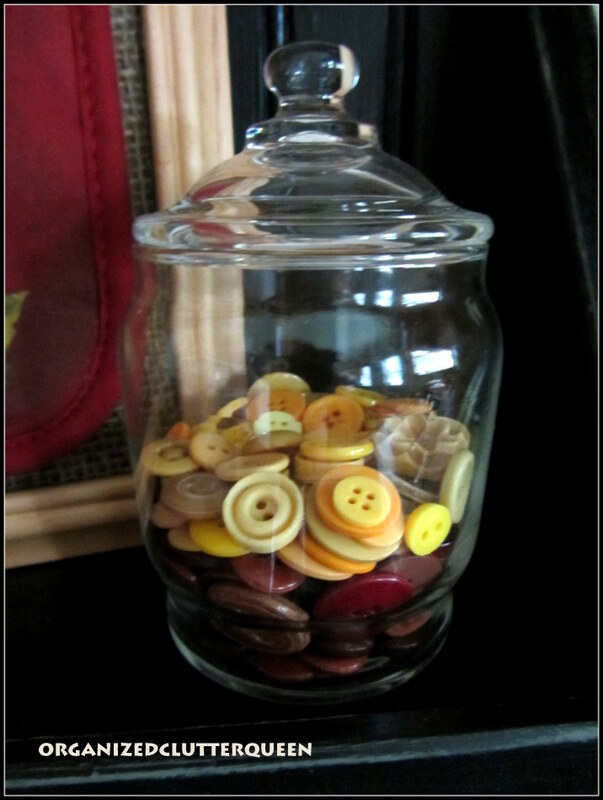 I dug into my button stash for some rusty brown, gold and yellow buttons in sunflower colors for the jar. The pitcher with wood utensils and rooster metal paper towel holder were already part of the kitchen. Have you ever framed a potholder? That is a great idea!! and I always see really cute pot holders, I think I will make a trip to KMart and see if I can find one like yours!! and the buttons in the jar, LOVE!! Carlene, that is truly thinking outside the box. I love it. THanks for sharing my friend! No, but I like it. I really like the shelf. The matching buttons look so cute with the pot holder. I'll post a picture of me in clown mkeup someday. 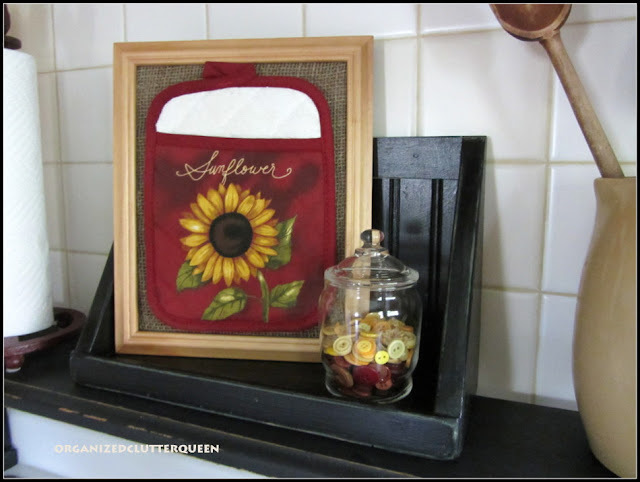 Love the framed potholder, what a great idea!! Love the framed pot holder!! Love the little jar of old buttons in colors to match! I've framed fishing lures, but never a pot holder! I have never framed a pot holder, but now that I've seen yours, I may have to do the same. Someone sent me some handmade pot holders, and I only wanted to display them, not use them. You have given me a great idea! Love you sunflower colored buttons! Such a cute idea and so resourceful. Love your "tweaking" ability..
That's a great idea! I also love the over the faucet shelf. Really handy I imagine. Love it! You are super-duper creative! I don't live near any of the 'good' stores either. Makes you think twice about how to make do...doesn't it. What a great shelf...Not only is it clever, but it is useful. I love your red, yellow and black color scheme. aren't you clever?.....framing a potholder and it's adorable! and love your over the sink counter too. So useful and a fun place to decorate for the seasons. 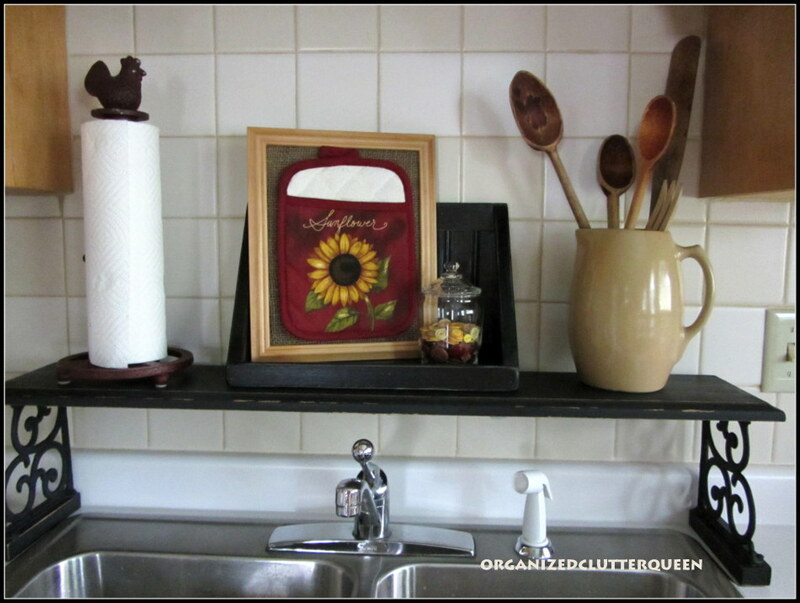 I love this shelf over the sink, I wish I could copy it, but with the window just near it, I don't think it'll work..so lovely! How fun the potholder framed, it looks great in the kitchen. Yep, I'm ready for fall decor too and I have no idea where to begin, lol..Thank you for your wonderful visit my friend. Carlene, can't say that I have ever framed a potholder. But what a clever girl you are. Especially love the touch of Fall with the jar full of Autumn hued buttons. Thanks for sharing with SYC. 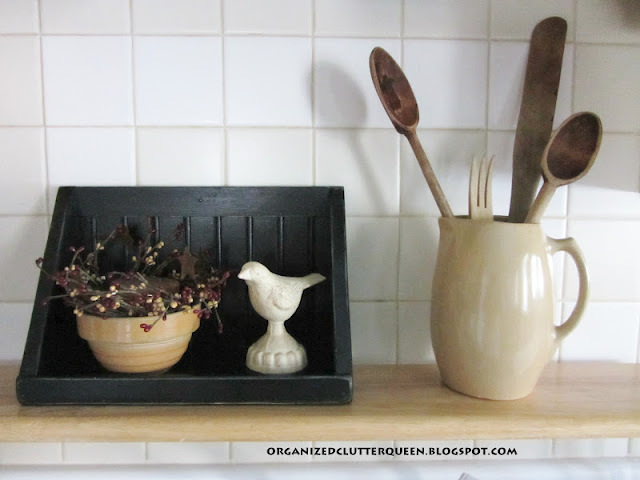 I just love your shelf - and love the framed pot holder - how genius! 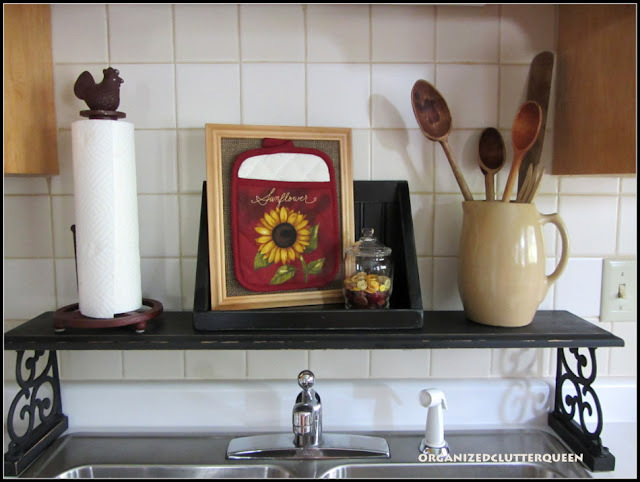 Calling by from Share your Cup, what a fun makeover for your sink area. I love your simple little 'art' over your sink. I live in a small out of the way town and I have to drive long distances to shop too. So anything I can buy at Dollar General and turn into FABULOUS is good. I love it. It's simple. ...And you can poke a flower in there if you wanted. OR...button flowers...Or...just about anything you wanted.